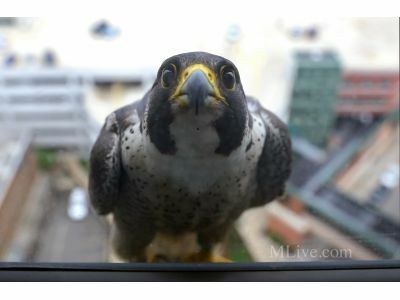 A name was picked by a special committee for the peregrine falcon that has made its home atop the 5/3 Bank Building in Kalamazoo. The name was one of 60 suggestions by community members. The winning name is Promise. "This name pays homage to the Kalamazoo Promise and gives the bird's name a distinct Kalamazoo connection, honoring its birthplace no matter where it may end up. It also speaks to the promise of more peregrines in Kalamazoo for years to come, thanks to many partners who have helped this amazing nesting success occur. Last but not least for the poets in the crowd, 'Promise' alliterates with 'Peregrine,'" the family said.